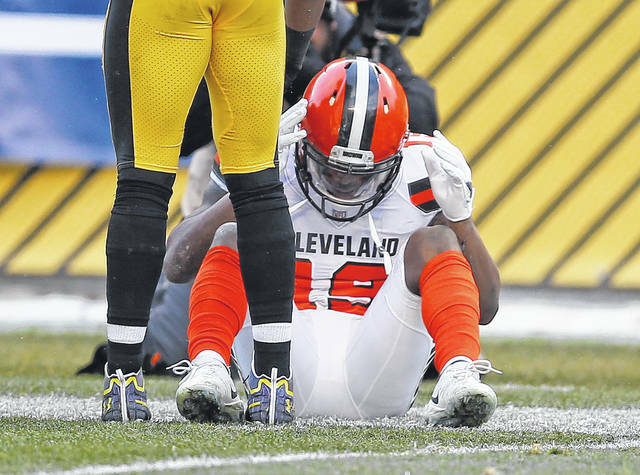 Cleveland wide receiver Corey Coleman (19) sits on the field after not catching a pass from DeShone Kizer late in Sunday’s game against the Steelers in Pittsburgh. PITTSBURGH — It was a lost season distilled to one play, filled with hope and achingly familiar anguish for a franchise that’s known little else over the last two decades. Fourth down. Trailing by four. One last shot at avoiding NFL infamy. Cleveland Browns rookie quarterback DeShone Kizer somehow escaped pressure. He worked to his left and flicked the ball to receiver Corey Coleman all alone on the sideline, well past the first-down marker. The ball smacked off Coleman’s hands then fell harmlessly to the frigid Heinz Field turf. Two minutes later, the clock hit zero. Pittsburgh 28. Cleveland 24. The Browns joined the 2008 Detroit Lions as the only teams to go winless during a 16-game season when they couldn’t overcome Pittsburgh’s backups or the kind of mistakes that have become their trademark during a turnaround that’s been stuck in neutral for 10 years, yet one owner Jimmy Haslam remains positive will come if his organization just keeps at it. And Haslam remains intent on doing it with head coach Hue Jackson. Haslam reiterated Jackson will return in 2018 despite a 1-31 record through two seasons. Cleveland is 4-48 since Week 12 of the 2014 season, has dropped 21 straight road games and 17 straight games to AFC North opponents. What Haslam knows new general manager John Dorsey needs to get Jackson over the next eight months are NFL-caliber players. The Browns have some, but not enough to compete with the likes of the AFC North champion Steelers, who improved to 13-3 despite sitting healthy stars Ben Roethlisberger, Le’Veon Bell and others to rest them for the playoffs. Cleveland has the first and fourth picks in the 2018 draft, and it’s the future — and not the present — that Jackson would prefer to focus on. There were signs of progress, as there has been all season. Just not enough to produce something resembling consistently competent football. Kizer finished with 314 yards passing and two touchdowns to Rashard Higgins but also threw a fourth-quarter pick, his NFL-leading 22nd of the season. While Jackson, who will jump in Lake Erie at some point in the near future to fulfill his vow the Browns wouldn’t go 1-15 as they did in 2016, is expected back in 2018, another offseason filled with searching awaits. Jackson plans to be along for the ride. The Steelers never trailed while beating their closest rivals for a seventh straight time. Landry Jones completed 23 of 27 passes for 239 yards with a touchdown and an interception, and rookie wide receiver JuJu Smith-Schuster caught nine passes for 143 yards and a score. He also returned a kickoff 96 yards for a touchdown . Pittsburgh sacked Kizer six times, boosting its season total to 56, a franchise record. Despite the victory, the Steelers will be the second seed in the AFC playoffs. New England clinched home-field advantage with a victory over the New York Jets. Steelers: Will enjoy a week off before hosting the divisional round the weekend of Jan. 13-14.
https://www.limaohio.com/wp-content/uploads/sites/54/2018/01/web1_01.01.18.browns.jpgCleveland wide receiver Corey Coleman (19) sits on the field after not catching a pass from DeShone Kizer late in Sunday’s game against the Steelers in Pittsburgh.